“In early 2012, a few months after the outbreak of the militarized Syrian revolution,” Jordanian-Palestinian political analyst Yasser Zaatra says in a think piece for Aljazeera portal, “I wrote about Afghanistan becoming the template for Syria. This sort of pessimism could be meant to promote a political solution, given that Fisk is not exactly a fan of the revolution. On the contrary, his travels to Syria are by special arrangements with the regime and he is usually embedded with its military units. Obviously, historical experiences, including revolutions, are never cloned. But parallels and close similarities always exist – not only in details and the course of events, but in the outcome at times. The first analogy in the Afghanistan-Syria case is that Iran’s entanglement in Syria mirrors the Soviet Union’s embroilment in Afghanistan. The Soviet Union was defending its international status after a protracted cold war with the United States and the West, which had earned it superpower status in a bipolar world. 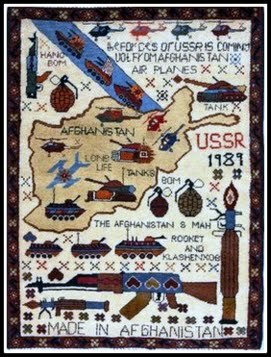 The Soviet Union felt its defeat in Afghanistan would wear down that status. The outcome proved much worse than expected, having ultimately led to the collapse of the Soviet Union altogether. Iran is in Syria defending her aggrandizement project, which cost her an arm and a leg to get off the ground. She feels losing Syria would cripple the project and force her back to her former status – a nation-state confined to her borders and a regional power comparable to Turkey. The Soviet Union thought it was defending a major design, deeming the implications of losing the battle won’t be short-lived but the commencement of sequential retreats. Iran is in the same frame of mind. Otherwise, Iranian leaders wouldn’t be saying defending Damascus is like defending Tehran. Tehran is not under threat so long as she remains open to dialogue. What’s under time pressure is the aggrandizement venture she has been fostering for the past 30 years. For the Soviet Union, the rallying call for the Afghan war was communism. It was the time when the Islamic revival was in its early stages, had no issues with the West and felt threatened by the atheist communist tide. Like the communist threat of former times, the threat of Shiism raised by Iran picking up the wrong end of the stick in Syria, made hackles rise in Arab popular and Islamic circles. They feel non-Arab Iran has exceeded her territorial bounds and her expansionist and hegemony plans must be restrained. To be more precise, hostility towards Iran today goes deeper than resentment of the Soviet Union during its Afghan war – perhaps for Arab proximity and emotional reasons. Another conceivable reason is the role of the social media in relaying news and exposing Syrian regime crimes. Much as the majority of Arabs resented the Soviet occupation of Afghanistan in the past, they now believe Iran has taken over Syria after it had swallowed up Iraq and empowered its cat’s-paw Hezbollah to rule Lebanon. True, Russia is also playing dirty in Syria – supplying arms to the regime and deploying Russian advisors to oversee military operations. But Iran and Hezbollah dwarf Russia’s involvement in Syria. Iran, with Hezbollah in tow, is directly in command of the Syria war, which Tehran is funding fully. With time, Iran will sink deeper and deeper in the Syria swamp. Unlike Russia, which shells out nothing, she will have to dish out more and more cash as her economy declines because of Western sanctions that are biting deeper than ever. Had Iran not coughed up some $20 billion to date to shore up the Damascus government, the Syrian regime would have collapsed already. Where fighters are concerned, there is a good flow of mujahedeen streaming into Syria – exactly as in Afghanistan’s case. In both instances though the total of native fighters is overwhelming. The number of rebel groups in Afghanistan was high as well, except that the Arab mujahedeen there did not have a political agenda beyond giving the Afghans a helping hand. Some mujahedeen in Syria are likely to chew over a particular agenda, but they will find few takers -- unless they are Syrian themselves, not foreign. Moreover, most of the mujahedeen in Syria are Arab nationals versed in Syrian society. They hail from one nation and share the same ethnicity and language, let alone a common religion. Much like Pakistan was the mujahedeen’s route to the Afghan war in the 1980s, Turkey is their route today to Syria. The identities of the mujahedeen’s backers haven’t changed – save for one key distinction. Whereas in the case of Afghanistan the United States and the West had an interest in confronting the Soviet Union, they now have nothing to protect in Syria other than Israel’s safety and wellbeing. This encapsulates America and the West’s stance on the Syria war. There were ethnic and sectarian differences in Afghanistan: Pashtuns, Uzbeks, Tajiks and Hazara Shiites. All had external offshoots. There is a comparable ethnic and sectarian diversity in Syria, each with external links too: Shiites with those in Lebanon and Iraq; Kurds with those in Iraq and Turkey; Alawites with those in Turkey; Christians with those in Lebanon; and Sunnis with those throughout the region. If Shiite Iran has adjunct Shiite minorities in more than one Arab country, the Soviet Union had political add-ons in the form of communist and socialist forces in more than one Arab country as well. In other words, Iran in Syria emulates the Soviet Union in Afghanistan. The lack of political foresight turned the Afghan stopover into an attrition war that eventually broke up a major empire. Ditto for Iran in Syria. Labels: Afghanistan, Alawite, Hezbollah, Iran, Iraq, Israel, Lebanon, Mujahedeen, Russia, Shiite, Soviet Union, Sunni, Syria, Turkey, U.S.